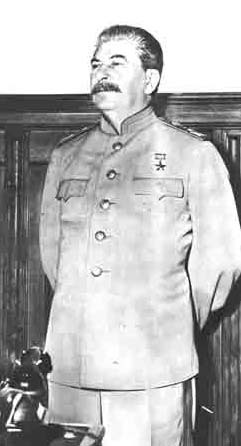 Joseph Stalin had been leader of the Soviet Union for nearly 30 years. Though he is now considered responsible for the deaths of millions of his own people through famine and purges, when his death was announced to the people of the Soviet Union on March 6, 1953, many wept. He had led them to victory in World War II. He had been their leader, the Father of the Peoples, the Supreme Commander, the Generalissimo. Through a succession of bulletins, the Soviet people had been made aware that Stalin was gravely ill. At four in the morning of March 6, 1953, it was announced: "The heart of the comrade-in-arms and continuer of genius of Lenin's cause, of the wise leader and teacher of the Communist Party and the Soviet Union, has ceased to beat." Joseph Stalin, 73 years of age, had suffered a cerebral hemorrhage and died at 9:50 p.m. on March 5, 1953. Stalin's body was washed by a nurse and then carried via a white car to the Kremlin mortuary. There, an autopsy was performed. 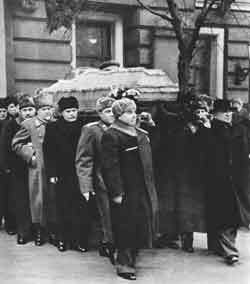 After the autopsy was completed, Stalin's body was given to the embalmers to prepare it for the three days it would lay-in-state. 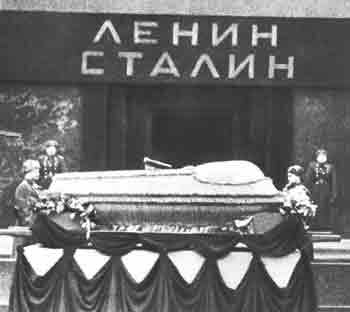 Stalin's body was placed on temporary display in the Hall of Columns. Thousands of people lined up in the snow to see it. The crowds were so dense and chaotic outside that some people were trampled underfoot, others rammed against traffic lights, and some others choked to death. 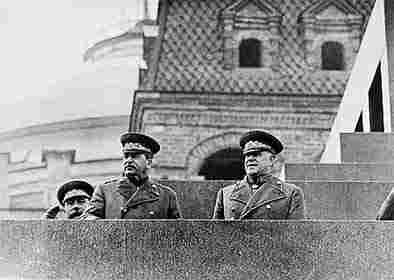 It is estimated that 500 people lost their lives while trying to get a glimpse of Stalin's corpse. On March 9, nine pallbearers carried the coffin from the Hall of Columns onto a gun carriage. The body was then ceremoniously taken to Lenin's tomb on the Red Square in Moscow. Only three speeches were made - one by Georgy Malenkov, another by Lavrenty Beria, and the third by Vyacheslav Molotov. Then, covered in black and red silk, Stalin's coffin was carried into the tomb. 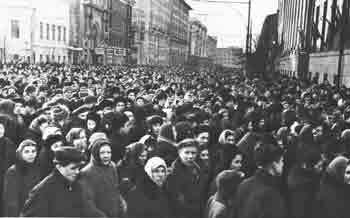 At noon, throughout the Soviet Union, came a loud roar - whistles, bells, guns, and sirens were blown in honor of Stalin.